Written for the design-savvy, Icon is all about the objects and architecture of everyday life - whether innovative tech and fashion, the most exciting cityscapes, restaurants and hotels, or the neighbourhoods with the most intriguing design scenes. Buy a single copy or subscription to Icon magazine. Followed by £19.99 every 6 months by direct debit. Followed by £36.99 every 12 months by Direct Debit. With content divided into three sections, Lifestyle, Architecture and Objects, it's pacier and more wide reaching, ready to read lounging on the sofa at the weekend, on the plane for a long haul, or on the train to work. 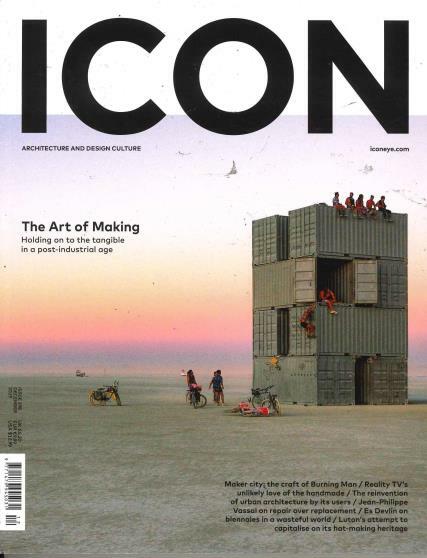 Icon distils the very best and most interesting places, people and things, as well as revisiting key projects and personalities that have shaped the industry. In amongst this, we're keeping hold of our top shelf contributors with solid, thoughtful critiques on the latest works, reports from major events (and the other stories of the emerging talent we find there), as well as incisive commentary.